Who will win this weekend's big kiddie matchup? Personally, I would like to see Borat: Cultural Learnings of American for Make Benefit Glorious Nation of Kazakhstan beat them both, but since the outrageously offensive Kazakhstani journalist's film is rated R, and is only opening in 837 theaters, as opposed to the G-rated Santa Clause's 3,458 and the PG-rated Flushed Away's 3,707, that seems unlikely. Third installments don't always do well, although Saw III is currently racking up at the box office so there are exceptions. Flushed has the theater count advantage, but Santa has history on its side. Has the franchise run out of steam, or will the computer generated boom falter with Flushed? 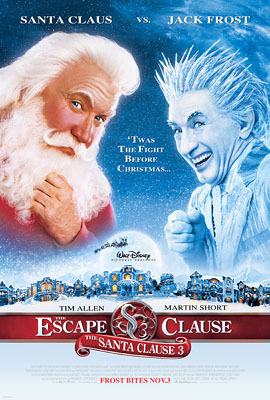 Entertainment Weekly and Variety are calling it for Santa Clause. 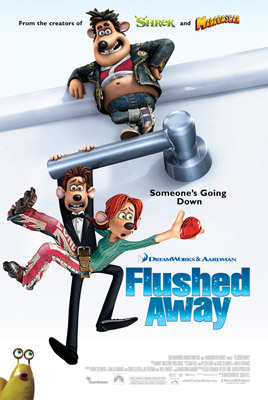 But I'm going to go out on a limb and say Flushed will win the weekend. With a higher theater count, an all star cast, and the huge popularity of CG films (plus a slightly higher PG rating that will draw in the "too cool for G" kids, without keeping out the tots), I think it looks like a winner. Look for Santa to be hot on its heels though, and to have longer legs throughout the holiday season. What do you think? Who will win, Santa or Flushed?